Art Deco style buffet or sideboard. It could also be used to house your stereo system or put your TV on top of it. Lots of storage capacity and flexibility. Made of solid maple, plywood and walnut veneer; no particle board. 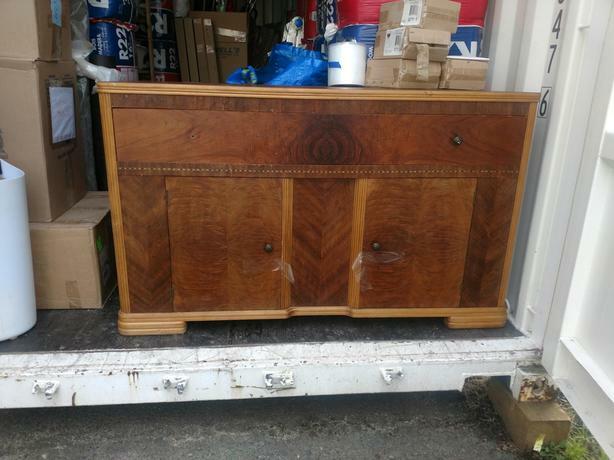 Generally in good shape but missing one knob and does need some cosmetic repair in 2 spots where the veneer is lifting (about hand sized spots). The veneer is still intact but needs to be glued down in those locations. Otherwise in good shape.